Use the "magic" no-mess pen to colour in a picture, and see vibrant colours, details, and patterns appear! 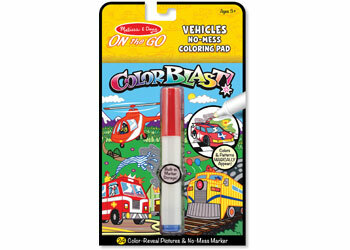 Each page of the 24-page activity book for kids three and older features exciting vehicle-themed artwork to complete and seek-and-find activities, too. The invisible ink marker only marks on the pages (not clothing or furniture!) and stores in the cover, so its a great travel activity.